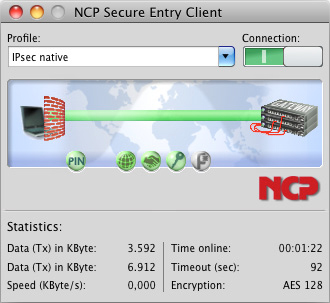 The NCP Secure Entry Mac Client is a component of NCP's Next Generation Network Access Technology. The IPsec standard forms the basis of highly secure data connections to VPN gateways of all well-known providers. The connection is set up via any network (including iPhone tethering via USB or Bluetooth). From anywhere in the world, mobile users can access a corporate network with their Mac. The NCP Secure Entry Client Mac is easy to install and to use. And the intuitive, graphical user interface shows all connection and security states before as well as during data connections. In contrast to the application based configuration of the built-in Mac OS X firewall, the configuration of this firewall is port based. NCP Interface Filter interfaces to all standard Network Interfaces from the PPP and Ethernet families. Additional Features UDP encapsulation, import of the file formats:*.ini, *.pcf, *.wgx, *.wge and *.spd. Download the NCP Secure Entry Client for Mac OS Datasheet (PDF).